Kanchenjunga Circuit Trekking is located remote area of Nepal. Kanchenjunga, the third highest peak in the world combined with the exploration of remote eastern Nepal makes the trek very unique. The area is famous for musk deer, blue ship and recounts tales of the Yeti. Limbu and Sherpa culture and hospitality is very welcoming yet, parts of the terrain is without habitation and still unexplored. Unique insight into rural lifestyle and rich Nepali culture makes the trip even more outstanding as the route is less trailed by travelers. Kanchenjunga Base Camp Trek is a well trailed route despite being a journey into the wilderness as the region bears a mild topographically and is easily accessible. 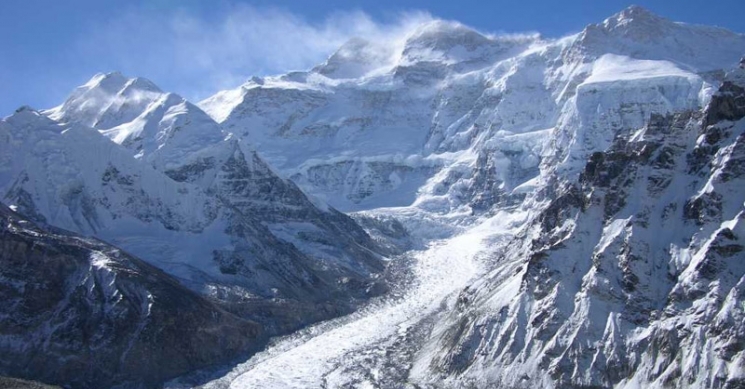 Kanchenjunga meaning Treasures of Snow stands 28,198ft tall, the third highest peak in the world. Considered a remote trek through Eastern Nepal, the trail passes restricted areas and takes the periphery of border to the Indian state of Sikkim. After a flight to Biratnagar and a four hour drive to Basantpur, the trek starts. Hille. The trail climbs through the settlements of the yak herders, Sherpa and Chhetri villages with a backdrop of the Kanchenjunga massif. Crossing the ridge towards the Tamur River, panoramic views of Makalu and Chamlang appear. The trail crosses the Mewa Khola at Dobhan and follows the Tamur Koshi. Dense rhododendron, pine and oak forests pass along the way. At Ghusna, a Sherpa village, prayer flags and gompas can be seen in plenty. 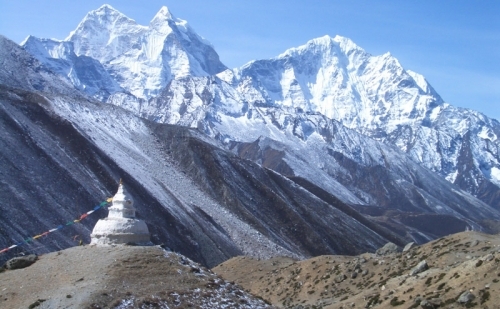 Jannu and other unclimbed peaks can be seen from a monastery nearby. 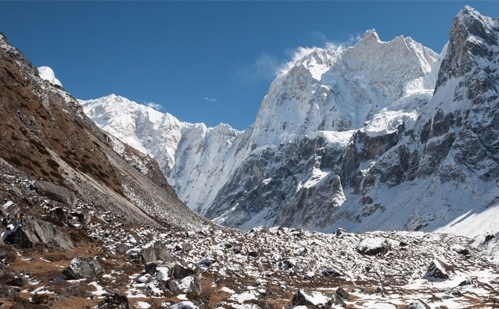 The trail passes through the edge of Kanchenjunga Glacier. After crossing the junction of Lhonak Glacier and the valley, we come to an extraordinarily beautiful clearing with magnificent landscape of unspeakable beauty where we set camps for the day. Lhonaks exploration continues for some days which includes the going to Pangpema to view Kanchenjungas north face. The slowly descending through Tortong, Yamphudim, Khebang, Phakholing, and Tharpu, we reach Bhadrapur from where we take a flight back to Kathmandu. Day 3 :Flight to Biratnagar (100m); drive to Basantpur (2200m), 120km/6h. Day 4 :Trek to Chauki (2700m) 15km/900m/7h. Day 6 :Trek To Dobhan(660m) 17km/-2200m/7h. Day 7 :Trek to Mitlung (890m) 14km/200m/6h. Day 8 :Trek to Chirwa (1185m) 14km/340m/6h. Day 9 :Trek to Sekathum (1640m) 11km/500m/5h. Day 10 :Trek to Amjilasha (2490m) 6km/900m/5h. Day 11 :Trek to Gyabla (2730m) 7km/250m/4h. Day 14 :Trek to Kambachen (4040m) 10km/600m/6h. Day 15 :Trek to Lhonak (4790m) 9km/650m/6h. 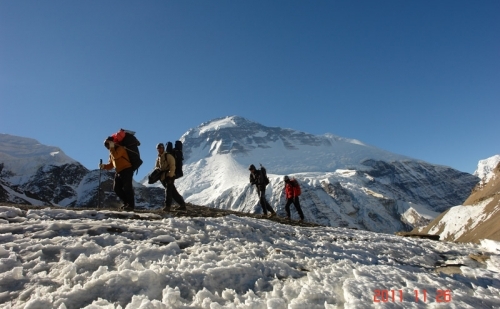 Day 16 :Explore Pangpema Base camp (5140m) 9km/390m/6h. Day 17 :Return to Ghunsa (3430m) 18km/-1250m/7h. Day 18 :Trek to Sele Lapass (4500m) 8km/1100m/6h. Day 19 :Trek to Tseram (3870m)& cross Mirgin La (4480m) 7km/400m/-1000m/8h. Day 20 :Trek to Ramche (4620m) 7km/650m,Octangand Yalung Glacier, walk 7h. Day 21 :Trek to Tortong (2995m) 15km/-1500m/7h. Day 23 :Trek to Khebang (1740m) 9km/900m/-1200m/7h. Day 26 :Drive to Bhadrapur, 190km/9h. Day 1 :Arrive KathmanduArrival in Kathmandu. Our Airport Representative will meet you at the Tribhuvan International Airport. A drop to the Hotel by private tourist vehicle is arranged. You can either take a rest or meet us at our office and know the detailed arrangement of the Trek. Day 2 :Trek preparation day After breakfast, you will be introduced with the trek leader/guide at the hotel. This pre-trip meeting is for briefings on the trek and other necessary details. Please bring along your passport and three passport sized photos and a copy of your travel insurance policy. You can use your free time to rest or explore around for some last minute shopping. A visit to the world heritage sites in Kathmandu including Swayambhu, Boudha, Pashupatinath, Kathmandu Durbar Square et cetera is also arranged as per request. Day 3 :Flight to Biratnagar (100m); drive to Basantpur (2200m), 120km/6h.The flight from Kathmandu to Biratnagar takes around 45 minutes and offers a bird’s eye view of the terrain below. We then take a five hour drive to the beautiful Basantpur, where we stay in a lodge. Day 4 :Trek to Chauki (2700m) 15km/900m/7h.We start our trek from Chauki and pass through small villages in the hilly terrain. Following the route to Tunde, views of Kanchenjunga and Makalu start to appear as we gain elevation. After about seven hours of walk, we reach Chauki, at a height of 2700m. Day 5 :Trek to Gupha Pokhari (2900m) 11km/300m/-100m/4h Today’s short trek passes through Milke Danda and leads to Gupha Pokhari(2900m). Day 6 :Trek To Dobhan(660m) 17km/-2200m/7h.The scenic walk passes through rhododendron forests and gives wonderful mountain vistas along the way. The walk is long but through an easy trail and leads to Dovan. Overnight stay in a lodge. Day 7 :Trek to Mitlung (890m) 14km/200m/6h.Passing forested areas, the trail offers views of beautiful landscapes. Today’s trek takes around six hours and we stop at Mitlung for the night. Day 8 :Trek to Chirwa (1185m) 14km/340m/6h.The trail takes dense forested areas and a narrow gorge today. We ascend and descend through small hills and pass through scenic viewpoints. First we reach the Sinwa, a small village and move downhill to Tawa. Climbing for some time, we reach Thiwa, where we cross a suspension bridge and continue along similar terrain to the Limbu village at Chirwa. Overnight stay in a lodge. Day 9 :Trek to Sekathum (1640m) 11km/500m/5h.After a short elevation, we descend to the plantation areas. Passing through dense forests, we cross the Tamor River and keep walking along the Tamor Nadi Valley through small hills until we reach the Ghusna River. After a short walk from here, we reach Sekathum where we stay for the night. Day 10 :Trek to Amjilasha (2490m) 6km/900m/5h.From Sekathum, the trail crosses a suspension bridge and passes through forested areas which leads to a steep. On the other side of the hill, we cross a river and ascend to a gorge to reach the village of Solima. Descending to the river again, the trail further moves on through more ups and downs until we reach Amjilasha. The walk takes us through small Sherpa villages and is quite challenging and cautionary at places. Overnight stay in a lodge. Day 11 :Trek to Gyabla (2730m) 7km/250m/4h.Today’s walk begins along the river banks and takes on some densely forested areas with rhododendron, bamboo and fir. The other side of the forest is a river which we cross through a small bridge. The trail then ascends along mesmerizing waterfalls and leads to Gyabla, a Tibetan settlement. Day 12 :Trek to Ghunsa (3430m) 10km/700m/5hAfter descending to the river, the trail slowly ascends and opens up to a valley and reaches Phale. The inhabitants of this beautiful village of Phale consist of Tibetan refugees, where we can get acquainted with their culture and traditions. Walking through pine and coniferous forests, we then reach Ghunsa(3430m), a Sherpa village known for its hydroelectricity plant. Overnight stay in a lodge. Day 13 :Rest day in GhunsaAs we would be gaining much altitude in the subsequent days, this day has been set for acclimatization and rest. It’s advisable to stay active, so a short hike to the Lapsan La Monastery has been scheduled. You can also explore around Ghusna and its wonderful periphery and enjoy the day’s rest. Day 14 :Trek to Kambachen (4040m) 10km/600m/6h.The trail slowly ascends through a river bank opening up beautiful mountain vistas. Walking past pine and rhododendron forests and meadows that amass with wildflowers, we cross the river at Rampur Kharka on a bridge. Walking towards the glacial valleys, the view of Mount Jannu gets overwhelming. Kambachen (4040m) is our destination for the day. Day 15 :Trek to Lhonak (4790m) 9km/650m/6h.As the elevation grows, the terrain becomes wild and rough. We pass along rocky fields and rough trail along the riverbank to a waterfall. Ramtang monastery is across the river along the trail after which comes a landslide section from where we descend down to the river and ascend again to reach Lhonak. Overnight stay in a teahouse. Day 16 :Explore Pangpema Base camp (5140m) 9km/390m/6h.The trek to Pangpema Base camp requires caution as we walk through slippery rock sections that are prone to landslides. The base camp is a flat grassy clearing where views of Jannu, Kanchenjunga and Chang are magnificent. We return back to Lhonak and spend the night there. Day 17 :Return to Ghunsa (3430m) 18km/-1250m/7h.After an early morning exploration of Lhonak, we move down to Ghusna. The descent today gives time for more exploration and sightseeing. Overnight stay in a lodge. Day 18 :Trek to Sele Lapass (4500m) 8km/1100m/6h.The trail again starts gaining as we move on to Sele La pass. It’s a strenuous climb through dense forest of pine, birch, juniper and rhododendron. Wonderful mountain vistas accompany us as we reach Sele La pass (4500m) where we stay for the night. Day 19 :Trek to Tseram (3870m)& cross Mirgin La (4480m) 7km/400m/-1000m/8h.Today’s strenuous journey passes through several high points like Sinion La, Mirgin La(4480m) and Sinelapche Bhanjyang making it an adventurous and scenic day. As we ascend, views of Makalu and Jannu get better. After a steep descent, we reach Tseram where we stay overnight. Day 20 :Trek to Ramche (4620m) 7km/650m,Octangand Yalung Glacier, walk 7h.The trail first ascends to the Yalung Glacier and passes the Simbuwa Khola. Then we walk past Lapsang village onto Ramche. From here we start exploring around the ridge and further along a stream to the top to view Kanchenjunga and Jannu peak. We may visit the Oktang Monastery or start our journey back to Tseram. Overnight stay in a guest house. Day 21 :Trek to Tortong (2995m) 15km/-1500m/7h.The trail starts descending as passes rhododendron forests along the way. Avoiding the Sele La route, we move alongside the Simbuwa Khola and walk all the way to Tortong. Day 22 :Trek to Yamphudim(2070m) 12km/600m/-2000m/7hThe descent further passes through Lasiya Bhanjyang where we encounter several landslide areas. Further on, we reach Yamphudin, a village with Sherpa, Limbu and Rai inhabitants. Overnight stay in a guest house. Day 23 :Trek to Khebang (1740m) 9km/900m/-1200m/7h.As we get to the lowlands, we begin to pass through beautiful farming villages inhabited by Brahmin and Chhetri people. Crossing a few passes, we reach Khebang where we stay for the night. Day 24 :Trek to Phakholing (800m) 14km/ 300/m/-1000m/7hYet another day of long hours of walking. We descend further to Dovan after which the trail is quite plain til Phakholing where we stay overnight. Day 25 :Trek to Tharpu/ (1600m) 6km/1200m/-300/4hThe slow gain in elevation towards Tharpu is a pleasing one, as we pass beautiful forest areas and small villages on the way. Tharpu is a beautiful village where we end our adventurous trek. Overnight stay in a lodge. Day 26 :Drive to Bhadrapur, 190km/9h.After breakfast, we take a bus from Tharpu to Bhadrapur. The journey approximately takes nine hours and passes through scenic hills on top of which rises the snowcapped giants. Overnight stay at Bhadrapur. Day 27 :Fly to Kathmandu (1330m)The flight to Kathmandu takes around 35 minutes and bestows wonderful views on a clear day. 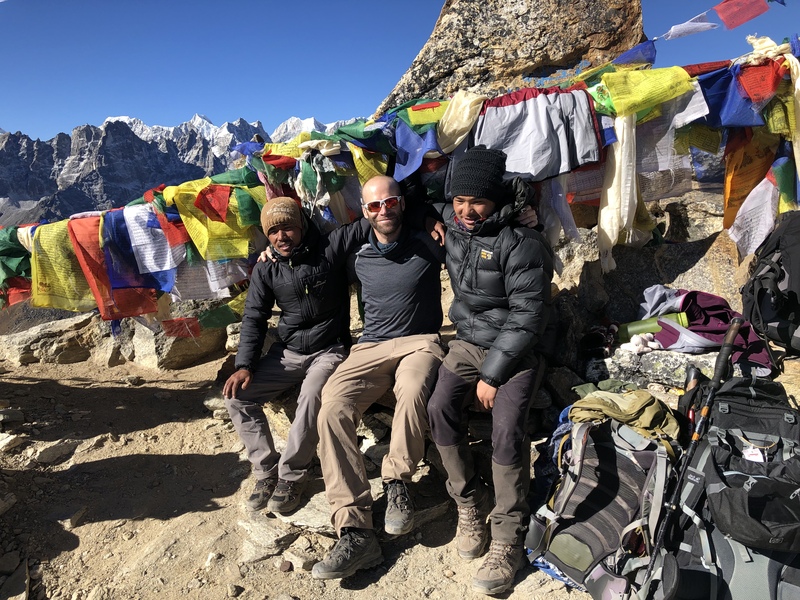 Green Valley Nepal Treks congratulates you on the completion of the journey and celebrates with a dinner in a typical Nepali restaurant. You can enjoy your free time taking a stroll around Thamel or shopping for souvenirs. Overnight stay in a hotel. Day 28 :Final departure or onward for next program Departure from Kathmandu. A drop from the hotel to the airport 3 hours before the scheduled time of flight is arranged in a private tourist vehicle. You can also opt for another package with Green Valley Nepal Treks and elongate your stay.